My name is Carson. Carson Doran to be exact. 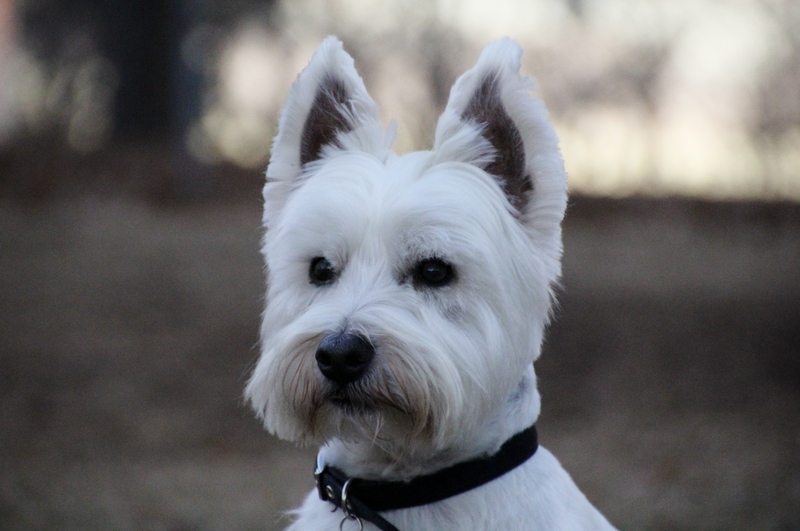 I am a West Highland Terrier, often referred to as a Westie. I am a bit larger than most of my breed, weighing in at a little more than 22 pounds. I am about five and a half years old, but not totally sure of my birthdate. You see, I was a breeder dog in a puppy mill for a while and accurate records are not a certainty. I eventually escaped, was found and then adopted by this most awesome couple in December of 2010. So much for the history lesson. By the way, I hi-jacked this blog site from Michael because I am bored stiff and wanted to complain about my situation (it seems that a lot of people like to complain, too). I have a bit of a problem; a conundrum to be more precise. I find myself very weak, can’t walk on my own very well, and have a bunch of hair shaved off my left hind leg and a couple other places on my body. I even have a bunch of staples over my knee. Odd, but I don’t recall putting those in and I don’t know how to use a razor. As to the weakness and bad limp, I can only assume they are related to the missing hair and staples. Sharp, aren’t I? Here’s the puzzle: one day about two weeks ago, I was playing in the snow-chasing wind-blown leaves of all things when my body went one way and one leg didn’t. I wasn’t too concerned at the time because I wanted to chase more leaves. I can’t help it; I chase leaves as much as I chase squirrels! It’s crazy, this behavior. I guess it’s the Terrier in me, or so I’ve been told. The next thing I know my parents started babying me; you know, carrying me up and down stairs and not letting me run. It was weird. Then I went to several doctors. I don’t like doctors or their offices. Then, it happened…the mystery. I awoke in a strange place-in a cage that reminded me of the old days back at the mill. I hurt and noticed the missing hair and then the staples. I thought staples were for paper so I almost freaked out, but was too tired so I just layed there. 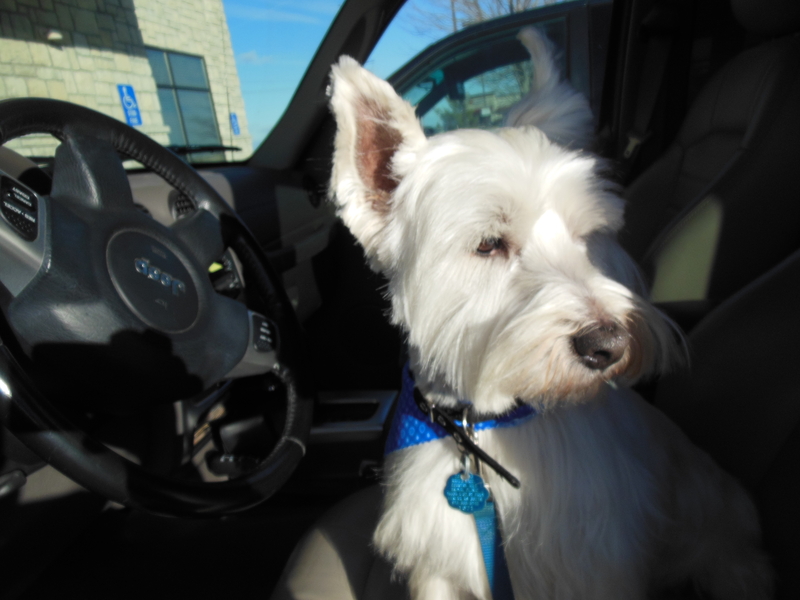 Good news, the next day my folks picked me up. They were so kind and gentle and treated me like a China Doll or some foo foo pet. I didn’t get it and still don’t, but hey, I’m at home which is what counts. As a matter of record, my folks treat me pretty darn good most of the time, but that’s between us. Okay? I can’t afford them getting big heads, if you know what I mean. Too many big heads these days. 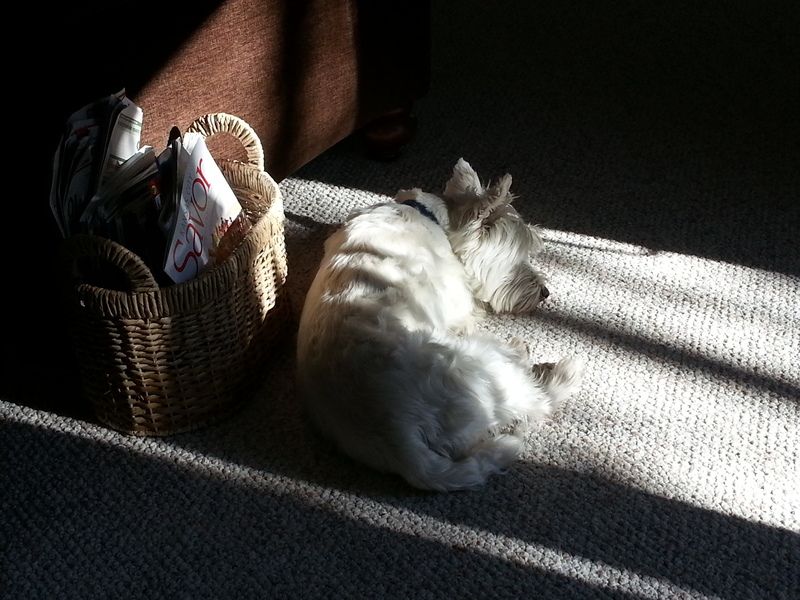 Speaking of home, I like laying on a soft carpet or bed soaking up the sun’s rays. It appears I will be doing this for a while so I better make the most of it cause who knows when this show will end? 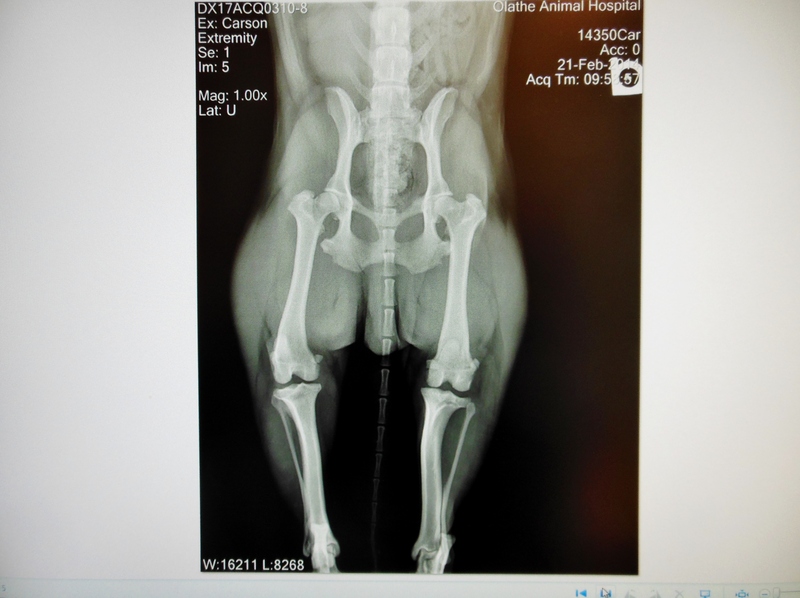 If you’re interested, I can tell you a little bit about what happened to my leg; actually my left hind knee. My dad told me after I bugged him a lot. It seems I have the same injury as many elite athletes get; a torn ACL, except on dogs it’s called a CCL for Cranial Cruciate Ligament. 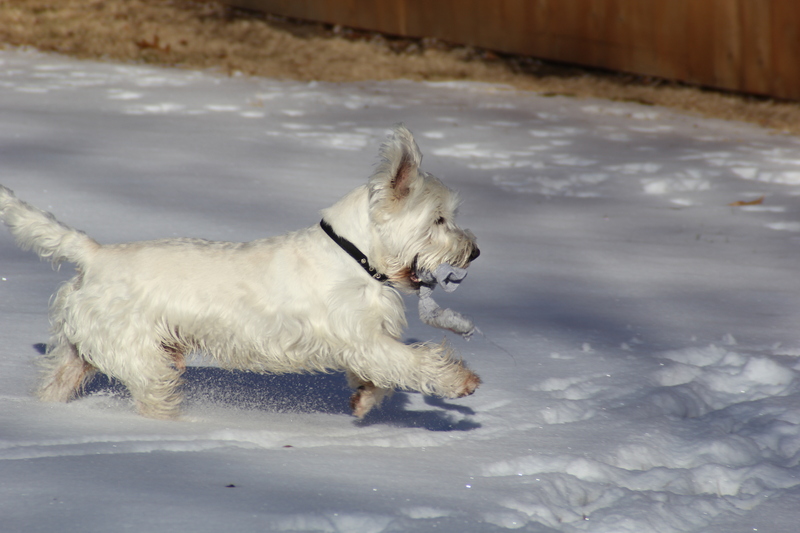 It appears to be the most common injury among canines, and the most common surgery…duh. There are three ways to fix a totally torn set of ligaments. 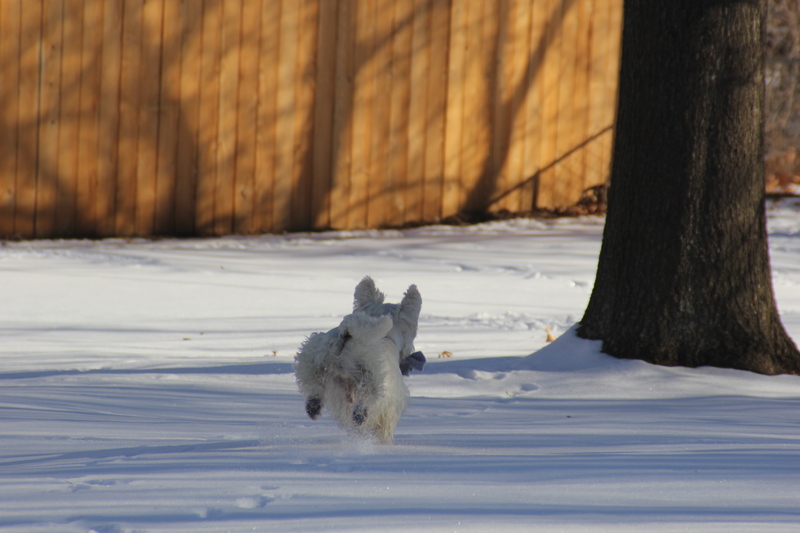 My folks chose the ‘gold standard’ method called a TPLO which is probably Latin for Tibial Plateau Leveling Osteotomy. 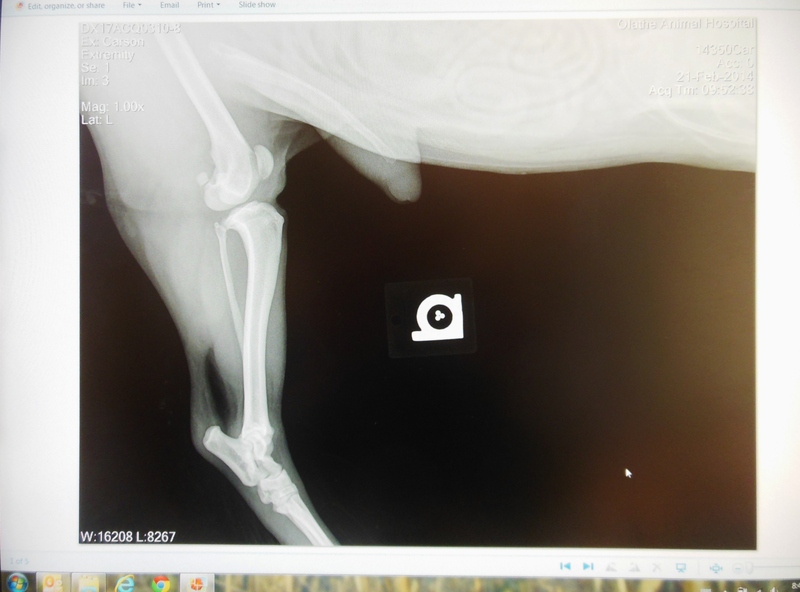 It seems that through selective breeding, exceptional dogs like my kind, have knee bones that don’t quite fit together as they should so the knee slips out of socket more easily than it otherwise would, and voila, a rupture. Larger dogs are more prone to this injury, but us active smaller pooches rupture these ligaments because, well, we’re active a lot. Remember the leaves! I can’t help it. Checkout this next photograph. This is a photo of an x-ray (radiography, as my doctor calls it) before the surgery. The knee (actually called a stifle in dogs) is just to the left of my…male part that protrudes from my body (I was going to say man part, but that didn’t make sense). I don’t have an after-surgery photo as yet, but this is what you would see: a metal plate, six screws and four pins of some sort attached to the lower bone which has been shaved a bit so this injury won’t occur again. That’s the theory, anyway. Oh, and let’s not forget those staples which itch like mad. I am supposed to take it super easy for six weeks. Aaaahhhh, I don’t think I can manage that. Guess what? That’s exactly what my folks said, too. They have to do all the heavy lifting and make sure I don’t run or jump or chew my staples off. I have to Not be a terrier for a while which is going to be a real challenge. I like being me. Really. Here’s another photo of my body: Caution, it’s x-rated. Pretty cool, huh? The actual x-ray reveals my tail bone much more than this picture, but you get the point (ha, I crack myself up!). Well, I won’t be doing anymore of this for a while (see photos below) so I better get off this computer before dad catches me playing blogger. I don’t know about you, but I’m ready for Spring. These snows and constant frigid temps are getting old. Not to mention the fact that they can be a dangerous combination. I’m lucky that my folks love me and care for me enough to baby me and pay for this surgery…I overheard them saying something about my college fund being significantly reduced. Can’t be worrying about things I can’t control, so I won’t. Don’t worry. Be happy. Or this………………………………………………………………………………………………..